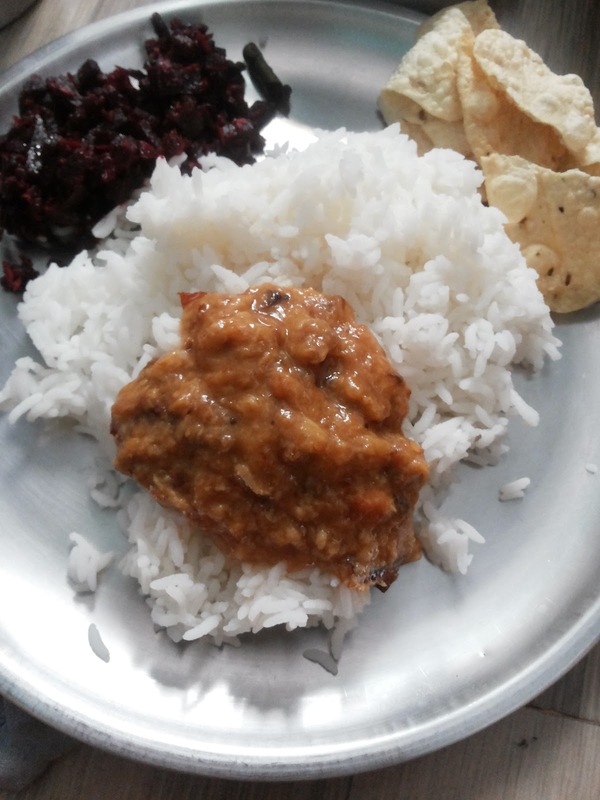 Poondu or garlic kadayal is a thick gravy or sauteed garlic mash which is famous in my grandparents village. 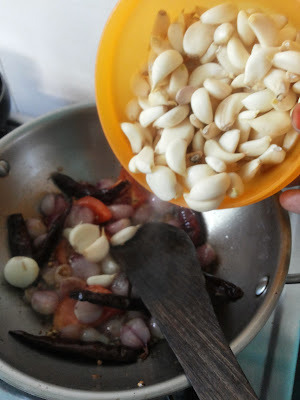 My grandmother used to peal lots of garlic.. for almost half a day.. half-a-kilo garlic for the next days' poondu kadayal. This is a very flavourful gravy. This recipe also calls for dry red chillies and coriander seeds for spice. Hence this gravy has a very unique coriander seeds flavour. This is for the people who likes the coriander flavour. Not everyone might be impressed with this flavour. But it is a acquired taste. Once you eat this a couple of times, you will like it thereafter. 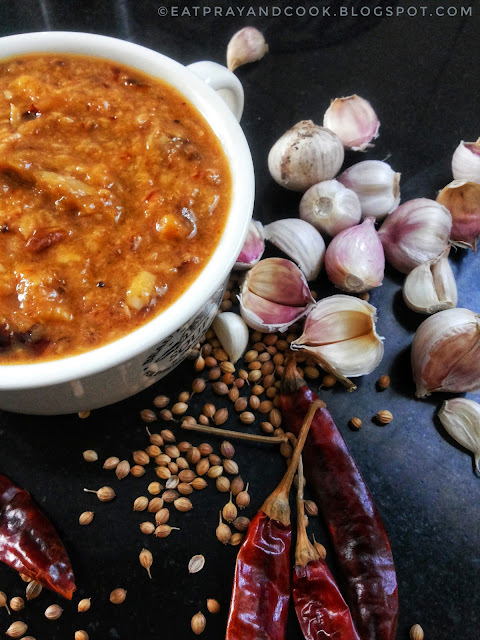 Very few ingredients and lots of garlic with coriander seeds - mashed up gives an excellent flavourful thick gravy best for white rice or ragi ball or idli or dosa. This is one of the best and flavourful way of consuming garlic as it has tones of medicinal goodness. let me give you the recipe.. 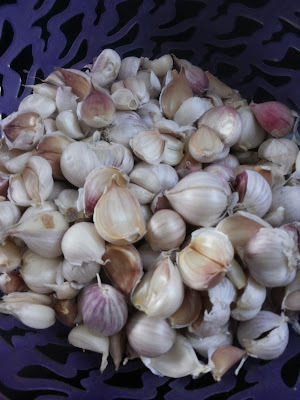 Choose the country-variety garlic. They are smaller than the hybrid garlic from china (the bigger china garlic). Peel the garlic and keep ready the previous day itself as it is a time consuming process. Heat some oil in a pan. Add the coriander seeds and dry red chillies. Roast them. Add the onions and tomatoes. Saute for few minutes. 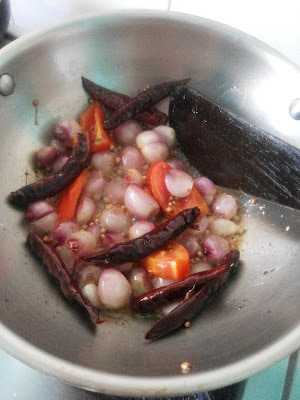 Add the garlic and saute for few more minutes till nice aroma fills the kitchen. This takes around 7 min. Now add the turmeric powder. Stir it well. Add a cup of water now and let it cook in medium flame. After 10 to 15 minutes the garlic must have been cooked. 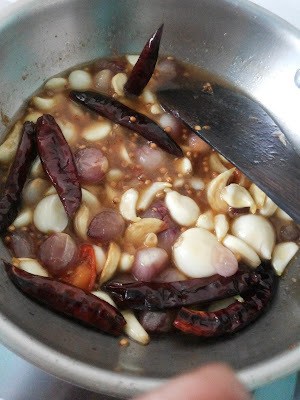 Now add the tamarind and turn off the stove and cover it and leave it for another 15 minutes. By now the tamarind must have been soaked well and the contents too would have cooled a little. Transfer this to the a mixer jar. Add sea salt and blend coarsely. 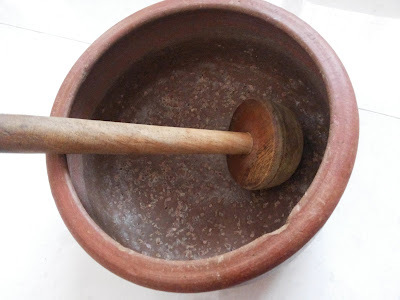 Traditionally we used to mash it up with the "mathu-satti".. the earthen ware specially used for mashing up such gravies. Add little more water if the gravy is too thick. 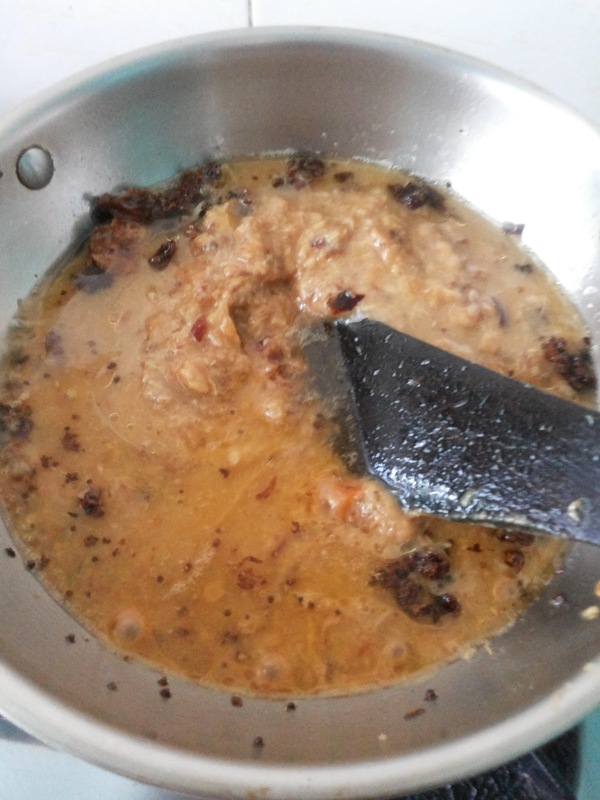 Heat some oil in another pan and add the tempering vadagam. Transfer this vadagam to the gravy. keep this gravy on stove and bring this whole gravy to one boil and turn off the stove. The flavourful garlic kadayal or poondu kadayal is ready to be served with hot plain rice or ragi "kali". The coarsely blend coriander seeds gives this awesome strong flavour to the gravy. If you find this flavour too over powering, then roast this dry red chillies and coriander seeds separately in little oil and make powder in a mixer jar and add this powder to the onion and tomato being sauteed (4th step in the procedure). This way you wont be getting bits of coriander seeds while eating. But we love it this way when we get the bits as it has this bursts of coriander flavour. 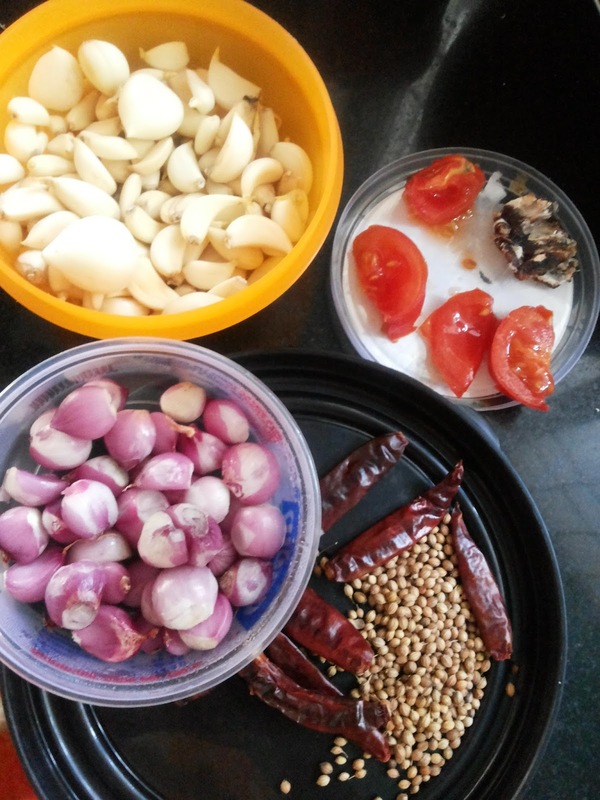 Those who are using this traditional "mathu-satti" for mashing the gravy, you too can roast this dry red chillies and coriander seeds separately and transfer this first to the satti. Now with mathu, powder this alone first and transfer this to the onion/tomato being sauteed. This way has better flavour than using blender as manual method is always good. 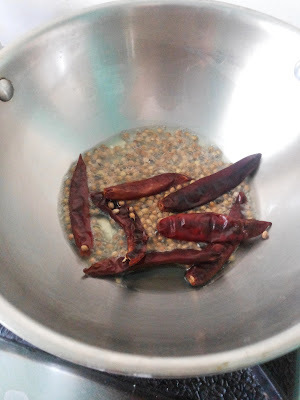 You can either use the tempering vadagam or just the mustard, urad dhal and curry leaves for tempering in the end. 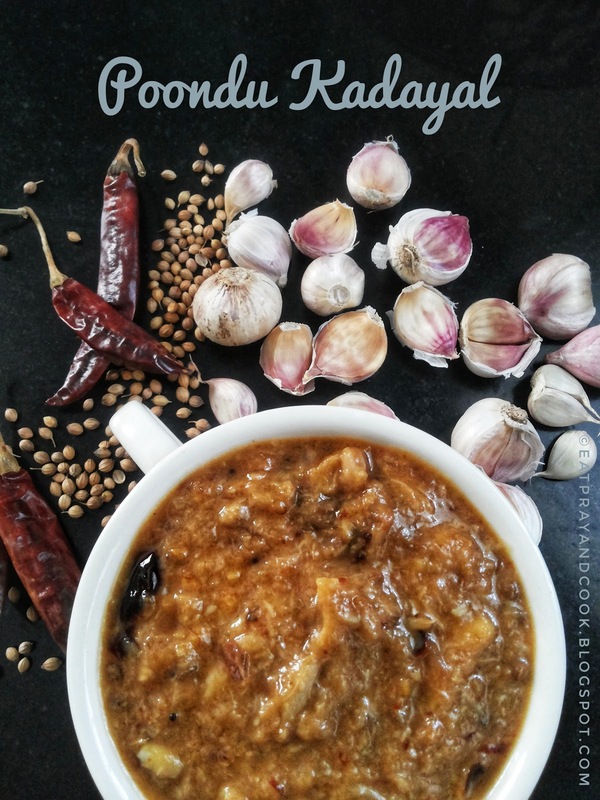 This garlic / poondu kadayal goes well with hot rice or ragi "kali" and even better with idli and dosai for the next day breakfast !